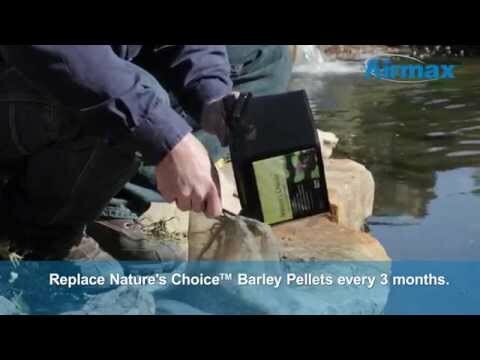 CrystalClear® Nature's Choice™ Barley Straw Pellets - Airmax® Inc.
CrystalClear® Nature’s Choice™ Barley Straw Pellets utilize barley degradation technology to help manage ponds all year long. When placed in an area of steady water flow CrystalClear® Nature’s Choice™ will slowly degrade and emit a natural chemical that cleans and polishes pond water naturally. Simply fill the included application mesh bag with the corresponding application rate and place bag in the pond in an area of water movement. Replace barley straw pellets every 3 months. Do not apply Nature’s Choice™ at any other rate than the rate prescribed above. Place application mesh bag in an area where there is water movement, around a waterfall, stream, spitter, etc. This will facilitate a gradual degradation of the barley and allow more barely extract to be released into the pond system. Pond may become cloudy after application, this is normal. Cloudiness should clear within 24-48 hours after application.